The way Kakuro plays is this. 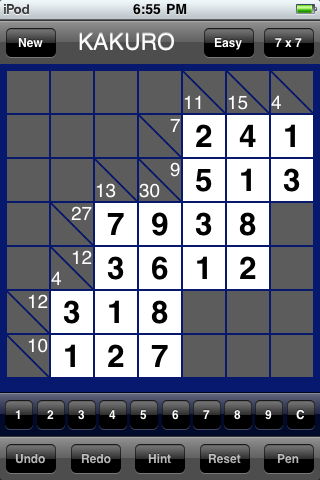 The game design is similar to that of Sudoku. You are given cells and grids and you have to fill the cells with numbers. 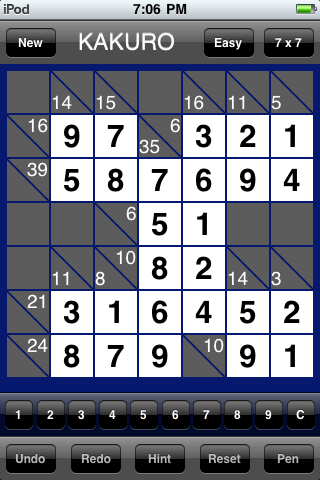 At the end of certain squares, there is a given number that you have to fulfil by filling up the rest of the squares. Hard to explain but look at the picture given below. You have to insert a digit from 1 to 9 inclusive into each white cell such that the sum of the numbers in each entry matches the clue associated with it (the numbers within the black/grey cells). Here comes the tricky part. The rule of the game includes no repetition of digits within the same row and column of that particular cell. However should the repeated number be diagonal of that of the number, it is fine. You then have to add up the numbers to fulfil the criteria given by the puzzle. Upon filling up all the cells with the correct numbers and thus fulfilling all of the clues provided, the puzzle is said to be completed. That sums up the way Kakuro (in other words the game we’re reviewing, Kakuro Mania) is played. Kakuro Mania allows players to choose from various difficulty levels (4 to be exact), allowing you to slowly adapt and formulate strategies for yourself. There are techniques that are commonly used to solve such puzzles. You can Google them up if you like, most of them are basically mathematical equations and thinking. You can choose the size of which the puzzle is generated. And that is basically all of it there is to offer. There is a hint option that allows you to check for errors and answers. Use it only when your brain is about to collapse or such else it defeats the purpose of doing such logic puzzles anyways. There is also a pen feature that is rather useless since inputting and changing answers for each particular cell is very easy and smooth. With that said, yes the controls and the way digits are inputted into each individual cell is easy and great. Visuals of the game are extremely simple but that is all there is to a puzzle game isn’t it. No in-game music but you can play your own music while you solve the puzzles. Great game for people who love logic puzzles. There is no end as of which the number of puzzles can be generated thus the replay value of the game is endless. I do wish to see a feature in future that allows people to save the puzzles whether completed or not (and the timing if it is finished). This allows for some competition between friends or something like that. 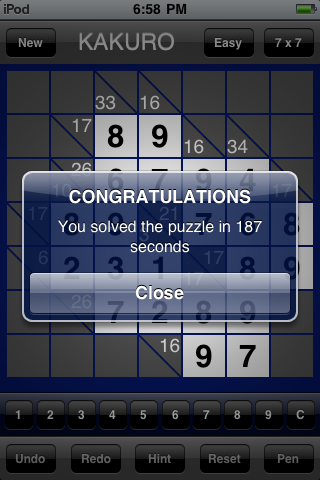 Other than that for the price and the number of puzzles you are getting, Kakuro Mania is a pretty good buy.